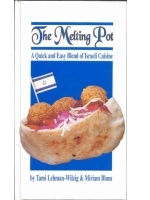 A collection of 36 Israeli recipes “quick and easy to prepare”, from falafel to Jaffa orange chicken, all made with ingredients easily obtainable anywhere in the world. An amusing introduction to Israeli eating habits and holidays. Each recipe is accompanied by a photograph and descriptive background to the dish.